A map showing the subsidence of the San Joaquin Valley in California. The more yellow the color, the larger the sinking of the land. Some areas around Corcoran have subsided by nearly 2 feet (60 centimeters) in little more than a year. 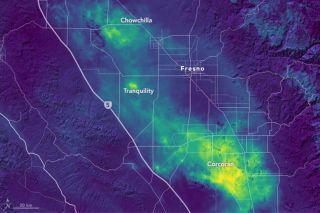 A new map made with satellite radar data shows the sinking of California's San Joaquin Valley in deceptively tranquil colors. The map, released by NASA's Earth Observatory, shows land subsidence between May 2015 and September 2016. The valley is sinking because of the pumping of groundwater from underground reservoirs, a problem exacerbated by the state's recent extreme drought. Areas with more yellow are subsiding the greatest amount. Near Corcoran, a bowl-like depression sunk about 22 inches (56 centimeters) over little more than a year, according to the Jet Propulsion Laboratory report. This area, which extends about 60 miles (97 kilometers) was already known to be sinking, as was a second subsidence hotspot near El Nido, where the satellite observations showed about 16 inches (40 cm) of subsidence over a bowl with a diameter of 25 miles (40 km). The observations also revealed a new subsidence spot near Tranquility, California, which has dropped 20 inches (51 cm) over an area of about 7 square miles (11 square kilometers). There were also a few inches of subsidence in other areas, including Davis and Woodland in the Sacramento Valley and a steep subsidence of about a foot (30 cm) near Arbuckle, California. "If you see a subsidence bowl, then something is going on at the center of the bowl that is causing the land to sink — for example, high levels of groundwater pumping,” report co-author Cathleen Jones of JPL told the Earth Observatory. "We can locate problem spots so the state can focus on those areas, saving money and resources." Land subsidence can damage buildings, roads, canals and other infrastructure, according to the U.S. Geological Survey (USGS). Subsidence can also cause problems for water transport, according to the agency — the California Aqueduct, for example, uses gravity to move water for irrigation and other uses, and changes in the topography can affect the aqueduct's flow. Subsidence can also permanently damage the underwater aquifer system that holds California's groundwater, according to the USGS. When the ground settles and compacts, there is less space for groundwater to stay. Subsidence can also affect rivers and wetlands as the ground changes shape.